My name is Sayeg and I am a SYLA graduate youth of CFJ, fighting for racial, social, and educational change. 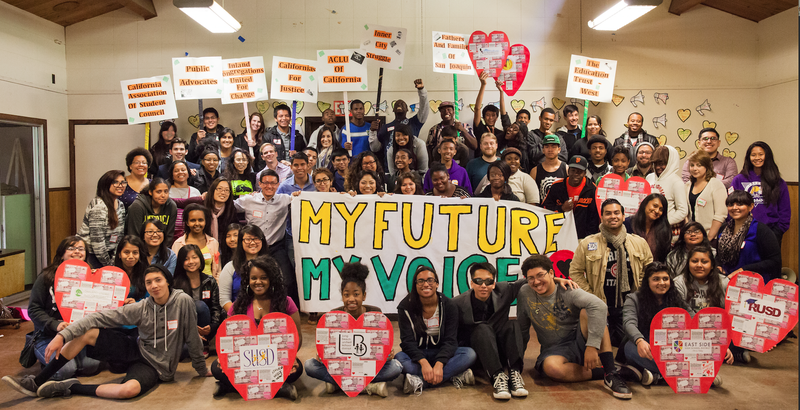 I attended the Statewide Leadership Retreat and Student Voice Townhall this past weekend to improve my leadership development and learn more about the My Future, My Voice Campaign. While attending SLR workshops and training sessions, hour-by-hour I could feel my body charge up like a battery because I felt so empowered. During the Townhall, I watched Student Board of Education Member Jesse Zhang speak about student voice in the LCFF process. It was touching to know that an individual near my age held a high position and engaged with the youth most affected by the issues. It gave me a sense of hope and has encouraged me to continue to improve my public speaking skills. Before arriving to SLR I expected to see all four CFJ regions, partners and students feeling enthusiastic about fighting for change in the LCFF final regulations and I must say, it exceeded my expectations! It was awesome to witness people across the state coming together in solidarity supporting each other and the campaign, building community with students and allies from other regions and creating systemic change through the skills we gained at SLR. A few things I took away from this retreat are a deeper understanding of the My Future, My Voice Campaign, and an understaning of the importance of the Local Control Funding Formula as it relates to our campaign. Learning the fundamentals of Base Building and learning how to do a Direct Action provided me with new tactics and strategies to fight for student voice in my local district. As I take those new skills with me, I am devoted to being a strong leader in my community and to speak for the voices that have been silenced. I stand tall with other youth in my community to demand change, because the students united will never be defeated! We have nothing to lose but our chains! ← Statewide Leadership Retreat 2014!